Come Celebrate Dallas’ Musical Heritage at the Site Where Many Moments Were Made! At one time in the early to mid-20th Century Dallas was poised to become the center of Western music. Some of the biggest names in early country music made some of their best hits here in Dallas. From time to time Dallas gets around to looking back at its past, and with a little digging, is rewarded by being reminded of its rich, cultural history. The story of music producer Don Law is a great example. 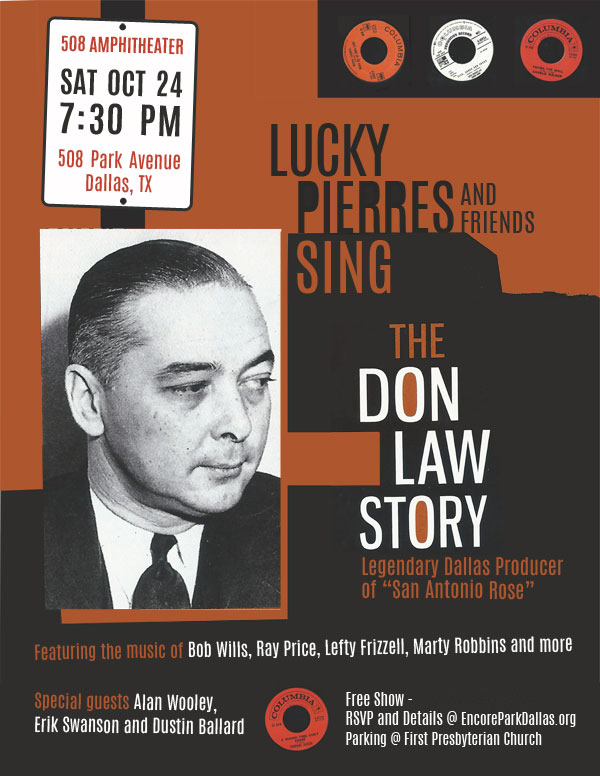 It was Don Law’s 1937 session that produced bluesman Robert Johnson’s rare recordings on June 19-20 at 508 Park in downtown Dallas. At the same location Law contributed to producing the recording of “San Antonio Rose” by Bob Wills, which went on to sell a million records. Later, Law produced Lefty Frizzell’s classic “If You’ve Got the Money (I’ve Got the Time)” at Jim Beck’s studio on 1101 Ross Avenue and helped to define the hard county sound of Ray Price at Beck’s studio. Law continued throughout his career to help shape the music of Marty Robbins, Johnny Cash, and many others. Longtime Dallas band the Lucky Pierres will celebrate Don Law’s western swing, honky-tonk, and hard country recordings on the very site where many were created. Friends Alan Wooley, from the Dallas bands Killbilly and the Cartwrights, and Erik Swanson and Dustin Ballard, from Shoot Low Sheriff, will also perform some of Law’s legendary productions. Parking: Available in First Presbyterian Church’s garage across the street at 408 Park Avenue.